There are a lot of easy parallels to be found between 11 bit Studios’ latest game and their first. Well, the first that I played. Far from a safe bet, This War of Mine was a grim, oft-bleak survival / management game that saw you manage a household of survivors living in an active warzone (loosely-based on the Siege of Sarajevo). 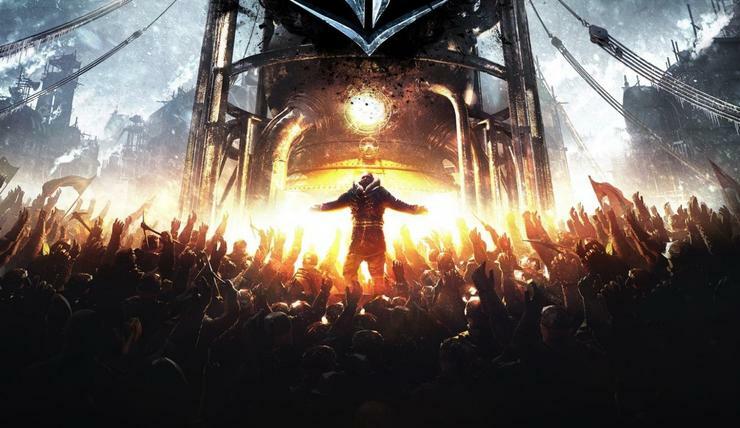 Frostpunk operates in and explores a lot of that same overlap between survivalism and scarcity but takes things in a slightly more optimistic direction. It’s a little lighter in tone, but not by much. Set in an post-apocalyptic alternate-history version of steampunk England, the game sees you take control of a small band of survivors who set forth from London after a new Ice Age begins. You’re tasked with building up a small settlement around a single working generator and managing heat, food, housing and healthcare for your citizens. As time passes, you’re even tasked with passing laws that constrict or protect the freedoms of your citizens in order to try and build up a better quality of life. 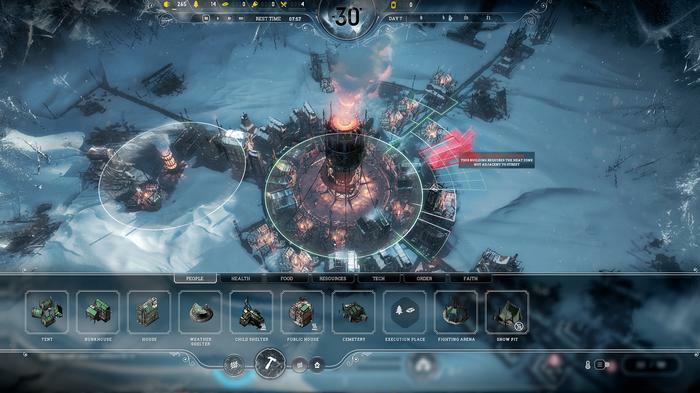 Like their first game, 11 bit Studios’ Frostpunk plays on and plays up the moral dimension that’s often conveniently omitted in most city sims. If This War of Mine asked you what compromises you were willing to make for the few, this one asks what you’ll do for the good of the many. 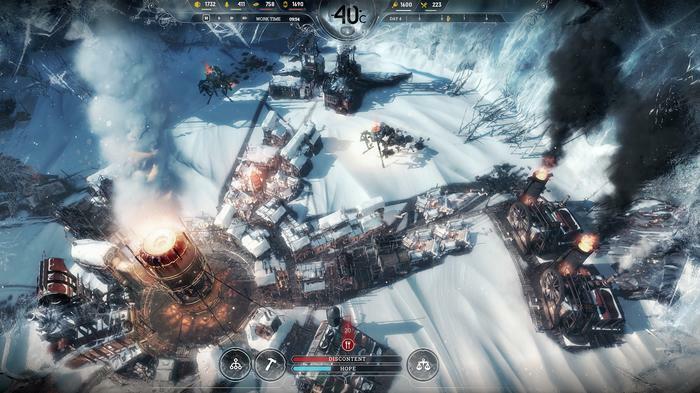 Rather than being about clinging to the old ways of survival no matter how bad things get, Frostpunk is about a world where things have already gone bad and how people navigate the rational-but-impossible compromises it takes to endure through such a cataclysm. As a experience, it’s both richly conceived and vividly realised. As mentioned above, the biggest mechanic here is resource management. There’s no RTS-style micromanagement, your actions are pretty much limited to assigning workers to this or that task. You can tell them to gather resources, build new structures, research technology upgrades, cook food or assemble roads. While all this magic happens, you’re left to deal with the passing of laws and the resolution of civil disputes in your (initially-small) community. That might sound a little mundane but it doesn’t take long for things to get interesting. Unlike other sims, your population only grows whenever your scouts find and bring back new survivors or whenever a group of refugees unexpectedly turns up on your doorstep. This makes the contributions of individual citizens in your settlement feel more significant and makes population management more dynamic and engaging. Sudden deaths (by accident or sickness or otherwise) can feel like a failure on your part to provide for the needs of your people while equally-sudden increases in population can put an unpredictable strain on your settlement’s existing infrastructure and supply lines. Sure, you might have the resources to build housing for new arrivals. However, doing so might in turn set back your efforts to provide better heating or healthcare for your existing populace - which will then turn them against you. If your city’s ‘Discontent’ level rises too high, you’ll be overthrown. If their ‘Hope’ level hits zero - you’ll suffer the same fate. The game operates on a 24-hour day and night cycle, so you’re forced to try and think ahead and manage your city in a way that’s sustainable. Though, at a glance, Frostpunk looks distinctly different to This War of Mine, it’s a credit to art team at 11bit Studios that it looks no less polished or unique in its presentation. I don’t know if I would necessarily praise it as the best looking city-management game around but it definitely hits the mark its aiming for. Steampunk-meets-snow isn’t something you see every day and the attention to detail here is neatly accentuated by a solid soundtrack. If I had to compare it to anything else, the alternate history board game Scythe comes to mind faster than another video game might. 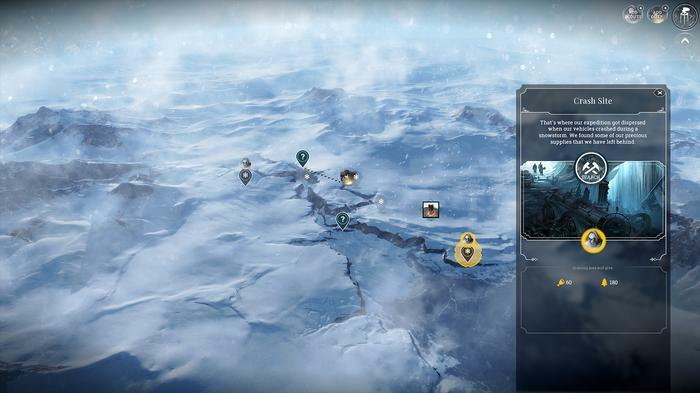 Similar credit has to go to the UI in Frostpunk. It’s got a ton of flair but still manages to do a more-than-decent job of serving as your primary interface throughout the game. It surfaces a lot of information using relatively-few menus and all-round minimal amount of screen space. That said, the building menu was infrequently plagued by an odd bug that caused the build road option to disappear from view. If there’s anything that didn’t quite stick the landing for me in Frostpunk, it was the heat-management side of things. Though there is a dedicated thermal vision button you can use to get a picture of where your city needs work, it felt like - even with all the relevant tech upgrades - it sometimes became far too difficult to provide both good external heating and internal insulation for my citizens. Faced with this reality I ended up settling on having bad heating but balancing things out with a decent healthcare system that could treat people as soon as they became sick. The game is broken out into three unlockable scenarios of various difficulties, with the first one - “A New Home” - acting as the game’s core campaign. This might not sound like a lot, content-wise. However, 11 bit Studios have built some inherent replayability into the game by branching the affair somewhat. About halfway through “A New Home”, you’ll be faced with either developing your society towards Order or Faith as a central value. Regardless of which branch you choose, these two options do contribute nicely to the ethical management sim niche that 11bit are playing within here. Unfortunately, in the absence of any competing ideologies to theocracy and totalitarianism, it does feel like the game railroads you into making uncomfortable choices. 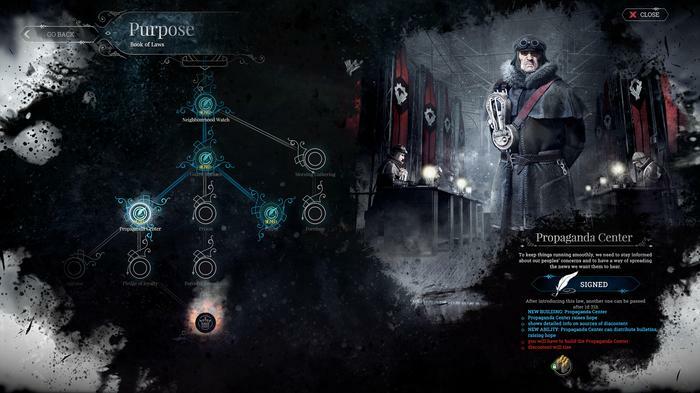 Frostpunk presents you with a radical, disruptive faction threatening the social fabric of your settlement and then the only tools it really gives you that are capable of stopping them are things like propaganda, prison systems and brainwashing. Yikes. I can’t help but feel like a better version of this would allow for more unconventional or progressive solutions to the problems it presents. A version of this game where I can turn my settlement into a radical anarcho-communist one is one that I’m more interested in playing than one without. Hopefully, adding a bit more depth and diversity to the systems here is something that 11 bit are interested in pursuing post-release, along with some sort of endless or sandbox mode - which does feel like a conspicuous absence. 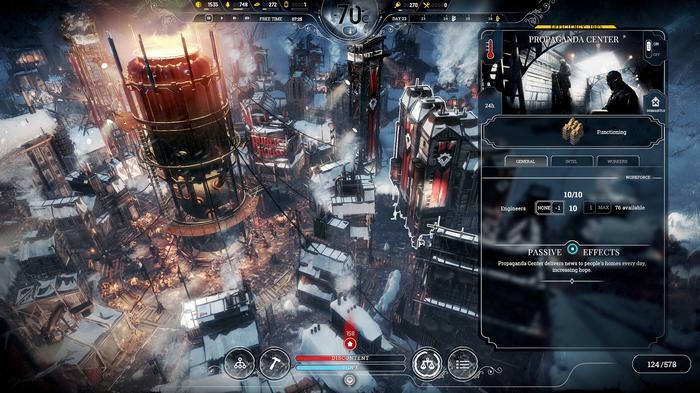 Each scenario in Frostpunk takes maybe five or so hours to complete and the game also allows you to configure the difficulty of each part of the experience - allowing for you to find a balance that fits the way you want to play through the game. In terms of the hours you’ll get out of this, it feels like it more than justifies the game’s price-tag, particularly if you’re already a fan of the genre. 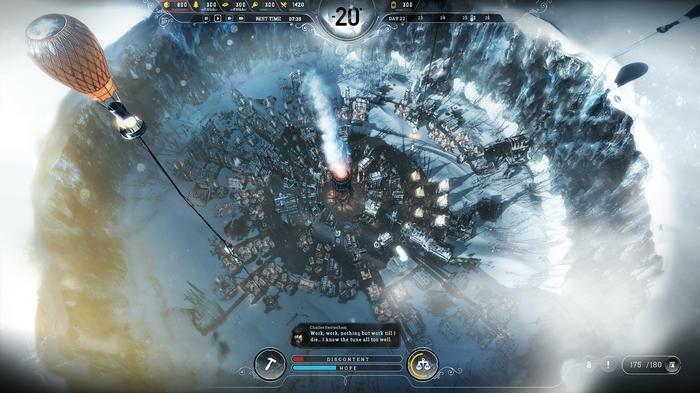 While the odds facing your survivors in Frostpunk are scarcely better than those that faced you in This War of Mine, the former emerges as a far more immediately-appealing affair. The premise feels fresh, the pieces look gorgeous in motion and the ethical dimension that 11 bit continue to build into city sims remains as compelling as ever. 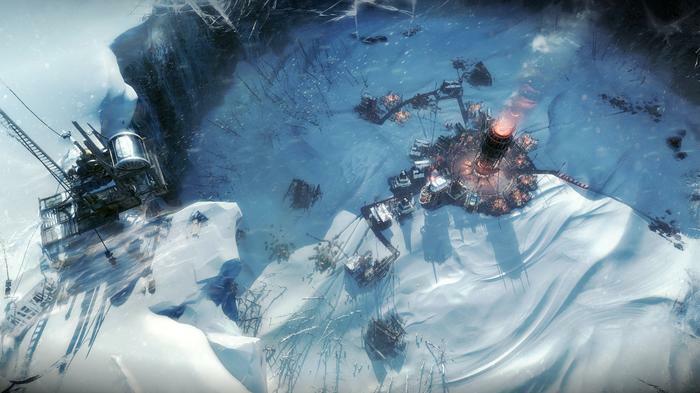 Whether you’re a fan of the genre or not, Frostpunk is absolutely worth playing.